Asheville, North Carolina has been coined as the trout capital of the Southeast for many years. With an abundance of rivers, creeks, and streams, there is plenty of water to fish! 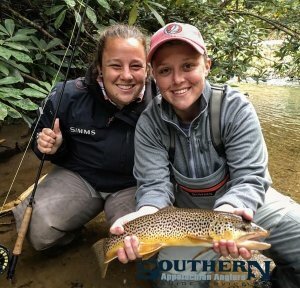 Our professional and certified fishing guides teach and provide lessons on how to catch trophy trout in Western North Carolina, on our guided wading trips. All of our guide trips include waders, boots, leaders, line, flies, rods and reels etc. SAA also provide lunch on full day trips. A North Carolina or Tennessee fishing license (depending on fishing location) is required. We can assist you in purchasing a license. Call us or visit our license page for more instructions on obtaining a fishing license. Experience the beauty of Western North Carolina's Southern Appalachian mountains with a fly rod in hand. We offer a variety of different streams and rivers to fish depending on your location. Rivers we fish include the South Toe, Cane River, Watauga River, Davidson, French Broad, Wilson's Creek, and more! 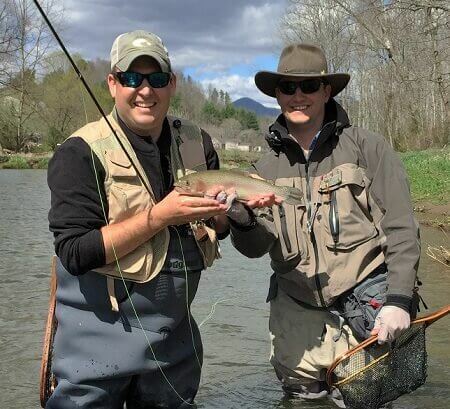 All of our guides hold over 25+ years of experience of fly fishing, guiding and both. Trained to teach others, our guides will provide the best fishing trips in the Western North Carolina region and will leave you with knowledge for future trips on your own. Call for more information on group trips greater than 3 people. We do accommodate groups larger than 5 people.